I miss you posts! 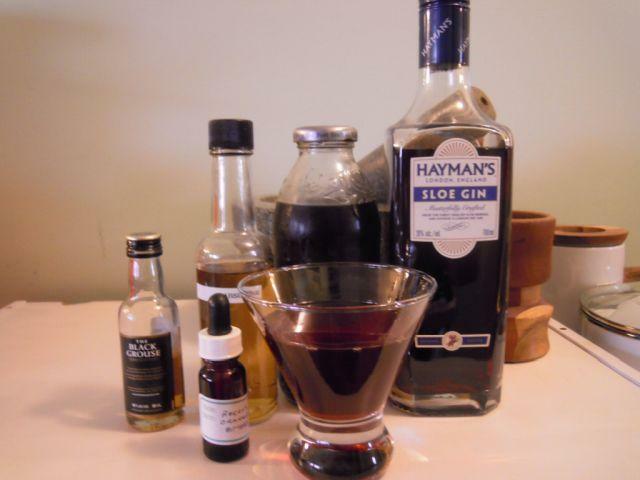 How do you like the sloe gin (and the applejack)? 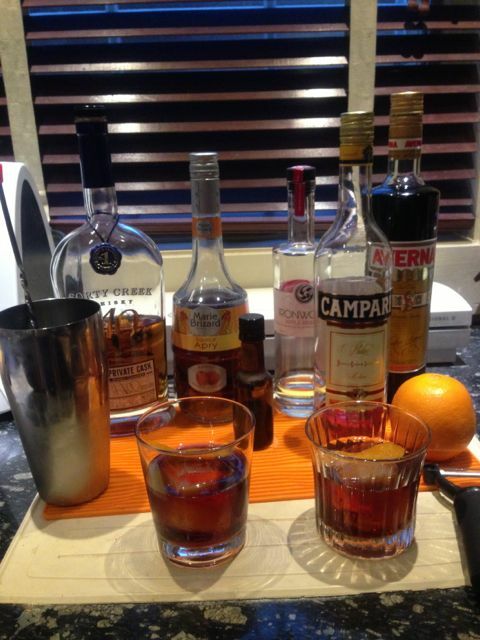 Mine was sloe gin and calvados and I will now pour a negroni to help me forget it! Hubby enjoyed it - I've had better! Next up - Sloe Gin Fizz I think. Sloe Gin Fizz - perhaps not quite as fizzy as it could have been as my siphon was low on water - but a much more satisfactory drink than the Tango! Two words for you: Modern No. 2. Nope! Definitely no. But thanks for trying. There is a taste that I am having a hard time identifying but that I find really, really off-putting. It's almost as if it is dredging up an unpleasant memory that I can't quite grasp. Sorry for the typo upthread- it should have read "I miss YOUR posts". Anyway, it's good to see you both again on this thread and I will be following your adventures with sloe gin as it's not something I have had a chance to try yet. Just tasted it neat - hard to describe - boozy for sure, a bit sour, a bit plummy, a bit cough syrupy but in a good way. Not picking up the juniper but I believe it is there. A touch bitter, too, right? 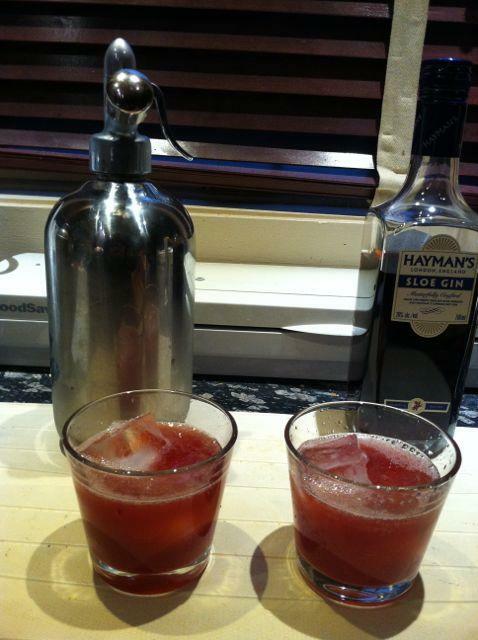 BTW, a touch of Campari is wonderful in a Sloe Gin Fizz. The Bitter Truth Sloe Gin was described as being more bitter, eliminating the need for the Campari. I've never had it, though. Indeed - a bit bitter too. 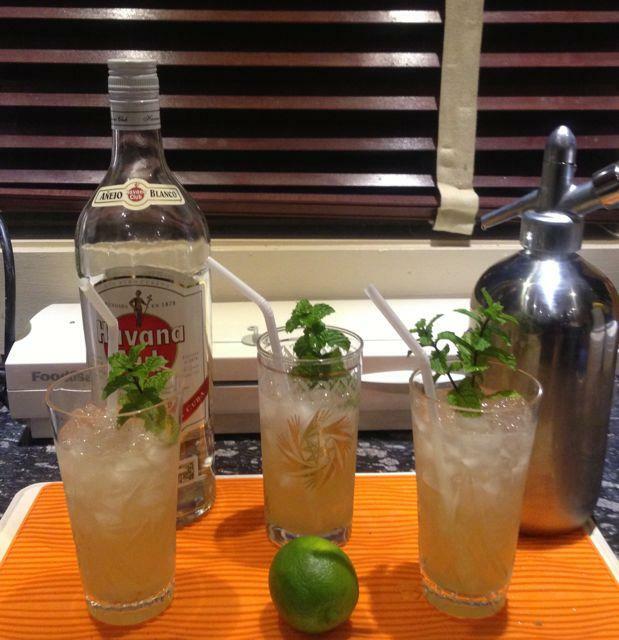 Mojito with some frost nipped mojito mint. I've got to remember to bring the bay and some of the mint in for the winter - with any luck it will grow for me inside. Forgot to snap a picture before I gave the boys their drinks. Anna and I found some Schweppes Bitter Lemon at the Punjab Market. Looks like it must be imported from eastern Europe - I think the writing on it might be Hungarian. 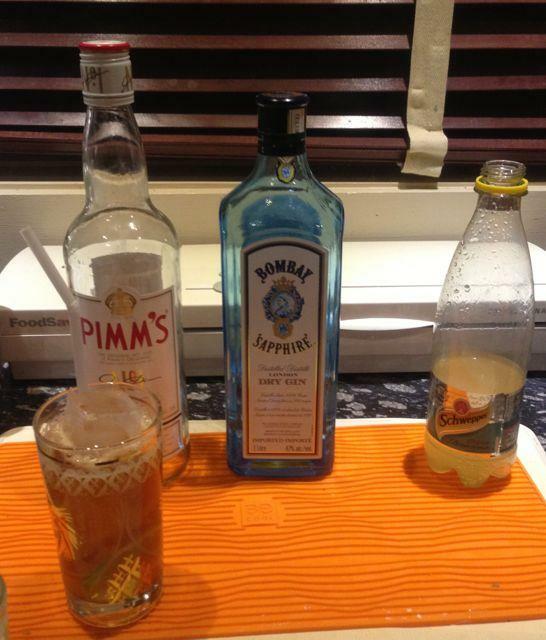 Used up the last of the Pimms, along with a bit of gin to make some Pimm's Cups. Tonight A Moment of Silence. I like the name :-) Makes me want to try it out. Kerry - How was the sweetness of A Moment of Silence? There was a comment that it was a touch sweet when make with Apry (as written). I've only used Rothman & Winter Orchard Apricot and liked it. And I'm the President of the Sugar Haters Club. I haven't had apricot liqueur in the house for a while, but this is such a nice drink that I think I'll pick some up today. It was a bit sweet - but I'm OK with that! 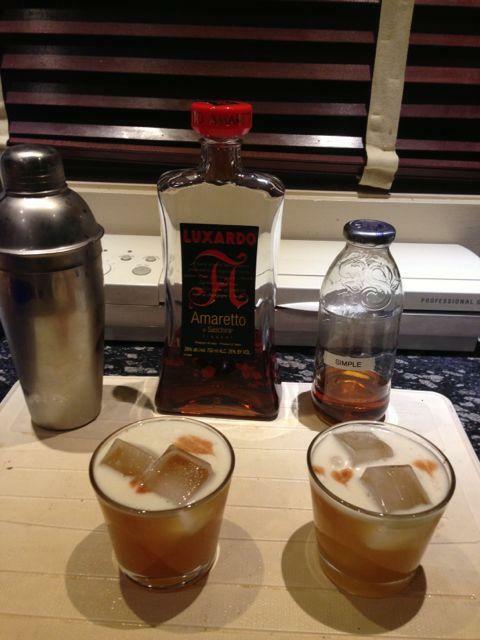 Another sweet one tonight - Amaretto Sour. Which recipe did you use Kerry? I like this one. I use the Luxardo and I can't get a cask proof bourbon here so I used Knob Creek. At 100 proof, it's as close as I can get on that one. I kludged it from a couple of recipes - so it was 2 ounces amaretto, 1/4 ounce simple, 1 1/4 ounces lemon, 1/2 egg white and a couple of dashes of angostura. I've got a bottle of Booker's perhaps this evening I should try his variation. 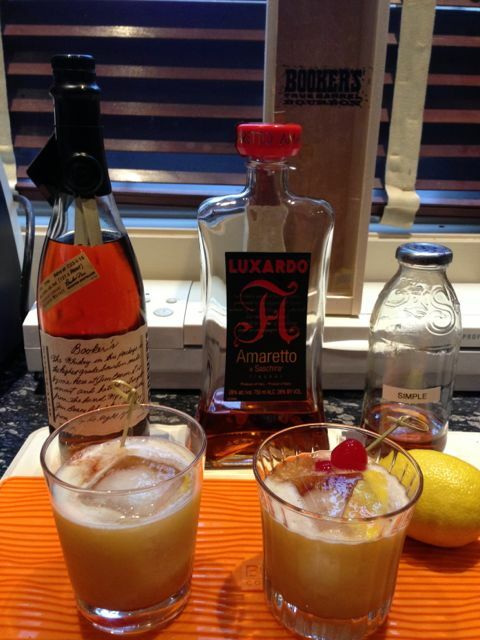 Tried the Jeffery Morganthaler Amaretto Sour suggested above this evening. While it was a perfectly lovely cocktail - I think we both preferred the simplicity of yesterday's version. Ah well, worth a try anyway. I like the addition of the bourbon.